Dia de los Muertos or Day of the Dead is the Mexican celebration of All Souls Day. It is celebrated with varying degrees of reverence and enthusiasm at Day of the Dead events across Los Angeles. Traditions include caring for the graves of family members, building elaborate altars to loved ones who have passed on and celebrating the dead with processions, dances and music. Calaveras, or skulls show up in masks, costumes, paper maché puppets, and candy, including sugar skulls that children decorate for the day. Every Mexican community in LA has their own festivities, from family events at local cemeteries to neighborhood block parties. Here are a few of the biggest. Sacred ceremonial tributes, altar creations and performances among some of Hollywood's most famous celebrity graves. Food will be available for purchase. Families are encouraged to come by Friday evening and Saturday morning to watch the altars being created. Arrive early to find the best parking. Parking: Check the website for nearby parking. Nine nights of Novenario processions through the Olvera Street Mexican market at El Pueblo de Los Angeles Historic Site followed by free pan de Muerto (sweet bread) and champurrado(a Mexican hot beverage). The city's longest running and most authentic celebration of the Day of the Dead, this East Los Angeles community arts celebration is now in multiple parts spread across multiple dates. A Noche de Ofrenda blessing of the altars (listed below) takes place the weekend before at Grand Park, and mask-making workshops are held for several weeks before the main event on November 2. Where: Workshops at multiple locations (see website), Exhibit at Self Help Graphics, 1300 E. 1st St, LA 90033. Festival at Felicitas and Mendez Learning Center (across from Self Help Graphics), 1200 Plaza Del Sol, Boyle Heights, CA 90033, Procession leaves Mariachi Plaza at 4 pm to walk to the event site. Part of the Self-Help Graphics celebration, the Noche de Ofrenda at Grand Park will include a blessing of 50 altars created by local partners, artists and non-profit groups, music, poetry, theatre and dance. The altars will stay on display through November 5, with free lunchtime tours available. Family festival featuring a Dis de los Muertos Art and Altar exhibit, with art-making workshops, performances and a costume contest. MoLAA is also holding three after-school Day of the Dead craft workshops Wednesday through Friday and a Thursday night Dia de los Muertos cocktail mixing event. Metro: Blue Line to 5th Street, bus 94 from 6th St or free Passport bus to museum. San Pedro celebrates Day of the Dead with a street party featuring live entertainment, an altar competition, food court and kids' corner. Where: 398 West 6th Street, San Pedro, CA 90731, between 6th and Centre and 6th and Pacific. 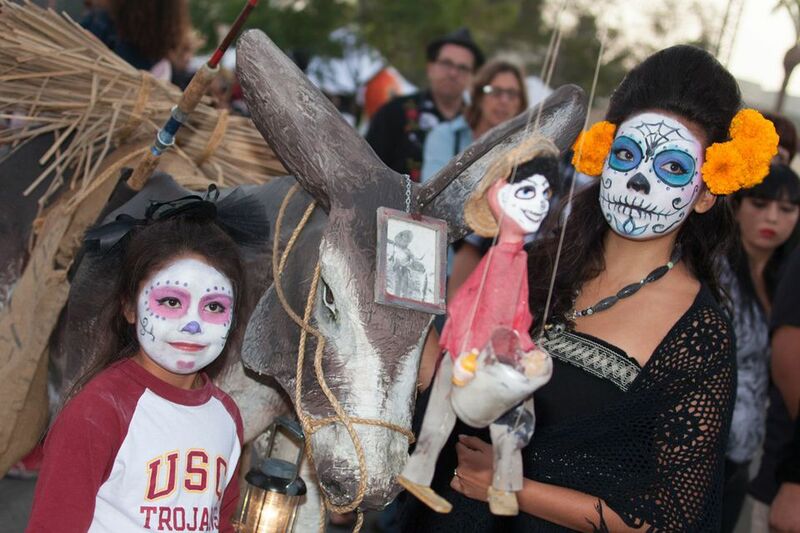 The City of Santa Monica hosts a free family celebration of life and death at Woodlawn Cemetery including an opening procession and ceremonial blessing followed by traditional Mexican music, storytelling, craft workshops and food for purchase. folklorico, altars on display, face painting, food trucks, shopping and more. Richard Montoya, Ric Salinas and Herbert Siguenza lead the LA-based Culture Clash, "shining a light on the brown rainbow and giving voice to the voiceless" and satirizing the election season in Vote or Die Laughing. Kids can decorate sugar skulls and make calavera masks. There will also be traditional face painting. Segerstrom Center for the Arts will celebrate Día de los Muertos with performances by Perla Batalla, La Santa Cecilia, Pacifico Dance and Quetzal. Bring a photo of your loved one to add to the altar and join in educational activities for Day of the Dead. Everyone in the community is invited to come together to build their altars to deceased loved ones or to bring awareness to social issues. The altar building and viewing is accompanied by cultural performances, art workshops, face painting, food vendors and more. Calavera face-painting, crafts, music, dancing and traditional foods in the courtyard of the Bowers Museum in Orange County.